Yang was joined by representatives from the USAID’s Bureau for Economic Growth, Education, and Environment, U.S. Department of State, U.S. Navy, and the White House to discuss the report and what the U.S. government is doing to address climate stability risks. These risks can be so interwoven that even well-intentioned adaptation or mitigation strategies can cause further harm, as reflected in the report’s seventh compound risk. In the case of biofuel expansion over the last decade, the replacement of food crops led to price spikes for many staple goods in developing countries, riots in some places, and land grabs that displaced thousands. “We often have good purposes in designing and promoting the expansion and diffusion of renewable energies but with negative side effects,” said Carius. The report offers four broad recommendations. G7 members should: make climate-fragility risks a central foreign policy priority, enhance cooperation with one another around these risks, set the global resilience agenda by informing multilateral processes and structures, and engage with other governments and non-government organizations to ensure global actions produce local results. There are also specific recommendations – like keep markets operating during food price crises and improve access to timely and accurate food data – broken down into five “action areas,” including global risk assessment, food security, disaster risk reduction, transboundary water disputes settlement, and local resilience. Calling water the common denominator for climate risk, Holmes suggested that asking the question, is there enough water?, will soon be protocol before the start of any development project. “As the world faces more and more dire challenges, the water programs are going to have to adjust and become much more linked to that whole array of risks,” he said. USAID has begun to move in this direction, developing a Water and Conflict Toolkit with the Wilson Center and adding a conflict annex to its Climate Resilience Development Framework, which provides guidance on incorporating climate change adaptation and mitigation into development initiatives. This type of integration is critically important to field officers, many of whom have technical expertise in topics like water resource management but not in peacebuilding. The vast majority of places where USAID invests in water programs are fragile or conflict affected. Climate change will impact the availability of water in these places and may create new “winners” and “losers” that exacerbate existing tensions or even inspire new conflicts. The Department of State has also recognized the report’s recommendation to “make climate-fragility risks a central foreign policy priority,” said Melanie Nakagawa, a member of the policy planning staff in Secretary Kerry’s office. Alongside conflict and violent extremism, climate change is one of four major focal areas in the 2015 Quadrennial Diplomacy and Development Review, the second-ever major strategy document for U.S. foreign policy. “Climate change is already exacerbating and complicating our very mission in many ways,” said Nakagawa. At the Department of Homeland Security, a 2009 executive order requiring all federal agencies to conduct sustainability and adaptation planning prompted an internal review process to see how climate change related to their mission, said Alice Hill, former senior counselor to the Secretary of Homeland Security and now senior director for resilience policy at the National Security Council. “We did not have a definitive consensus view within the department and so we had the hard work of answering that question and looking at all of our mission spaces to determine that, in fact, we should care deeply,” she said. These and other recent efforts by the Obama administration to mainstream climate change have led to real shifts in policy. Hill said, for example, that all new U.S. government development projects will be screened for climate risks by October 1, 2015. From the U.S. military’s perspective, fragility and instability means the potential for more deployments, from emergency relief to warfighting. Rear Admiral Jonathan White, oceanographer and navigator for the U.S. Navy and director of its Task Force Climate Change, said the Pentagon is very interested in helping to determine what countries are most vulnerable climate-fragility risks and participating in resilience-building partnerships with other branches of government. White likened building resilience to moving the red line on the tachometer of a sports car, so a country can take more gas (climate change) before overheating (fragility or conflict). Determining where that red line is and what can be done to move it is the challenge. White said the military is ready to be part of a national and international team effort. The National Geospatial-Intelligence Agency, for example, which has extremely detailed satellite data, wants to become involved in determining climate vulnerability and anticipating challenges, he said. U.S. leadership in this space is very important, said Carius – “It is a collaborative effort.” A task force created by G7 member states is now reviewing the report’s recommendations for further action. In the interim, NewClimateforPeace.org is as an information platform on the seven climate fragility risks for both policymakers and the public. “We would like to extend the scope of the study a little bit and not exclusively look at those countries that either call themselves fragile or are labeled fragile but look into fragility itself,” said Carius. The focus should not be on labeling or pigeonholing countries, but engaging with these complex challenges that can affect any state and cross agency responsibilities. Sources: Adelphi, The European Union for International Security Studies, International Alert, USAID, U.S. Department of State, U.S. Navy, The White House. 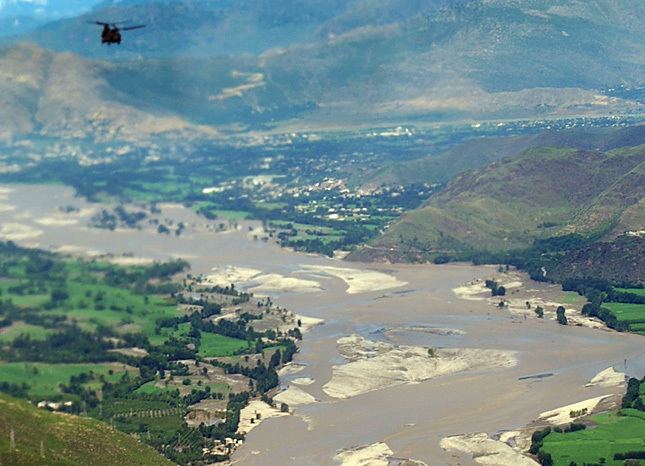 Photo Credit: A U.S. Army helicopter performs relief operations in Pakistan, August, 2010, courtesy of Monica K. Smith/U.S. Army.